I think you’d be surprised how much clothing comes up when talking with my career and business coaching clients. What is it about what we wear that seems to have such power over us? Haven’t you put on a nice outfit and you suddenly feel like a million bucks? 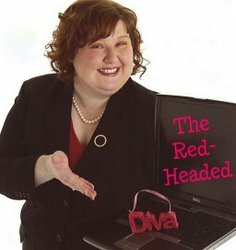 (Like The Red-Headed Diva shown in the photo.) Conversely, the wrong outfit can ruin your mood. Sometimes we pretend we’re “above” that fashion stuff (while we secretly watch makeover shows). Let’s forget about judging or questioning it. Instead, let’s take a lesson from the drag queens who know the power of a great outfit! Let’s consciously use that power of our clothes for our benefit. I’ve had those days I felt like a million bucks… and days when my outfit ruined my day. Finally I took time to notice what made the difference so I could have more of the “feeling great” days. That feeling seeps into my confidence and how people respond to me. We think we have to wait until we’re confident to wear something bold but I recommend trying it the other way around. Let your clothes lead the way. Is it more subdued or “frumpy” than I really want to be? Is there an outfit I’d rather wear that I think I’m not “ready” for? When my clients begin to have a new vision for their lives, they sometimes realize they’re wearing clothes that don’t reflect their new vision. They were dressing like someone they thought they were supposed to be. Notice what style is calling you. For some people it’s about wearing something brighter, less “businessy,” or more sophisticated. What is it for you? Go shopping with someone that can help you stretch into the new you. Look in your own closet to dig out those items that you deemed too bold before. Is this the look I want? Once you find that YES outfit, let it change you. If you feel like standing up straighter, let it happen. Live into it. It’s not about fixing anything. Some women dress more feminine than they feel because they’re afraid to appear too “butch” for our culture. While other women dress more subdued so they’ll be taken as seriously as men. Men and transgender people have their own versions of these gender-related clothing themes. Not to mention all the other identity issues that come up with clothes. no matter how “freaky” you feel. It’s just like the ugly duckling that felt ugly until she realized she was a swan. It can feel like “coming out” and I know that’s a big deal, but remember that you’re coming out as a swan! You will be embraced much more than you think because people are drawn to authenticity. When you dress from the inside out, that’s when you’ll feel like a million bucks. Consider hiring an image consultant. A simple book to help women find their own style, beyond what’s trendy. An organization that provides professional attire and career guidance to disadvantaged women. Find a local store that is dedicated to helping their customers find their own look. Boutique stores can be great at that. Don’t settle for a place that pushes the wrong look on you. I’d love hearing your comments below. Originally published on April 20, 2011. Last revised on November 23, 2015. Posted in Finding Your Voice, Transition Pains and Joys | Tagged clothes, confidence, inspiration, Leadership, Networking, work life | Bookmark the permalink. Its very difficult to decide what to wear as formal or informal wear. Pant suits are considered to be suitable for every occasion whether as a formal wear or as a wedding dress. They are available in different styles and designs. Woman really look stunning in these pant suits. On Saturday night my wife and I went shopping for me. She is an artist and understands color. She helped me pick out some clothes that I would never have considered, with my Brooks Bros. mindset. I am excited about using clothing to call the proper attention to myself- standing out in a good way. Perhaps you’ll wear a new outfit when I next see you! Hi Val…you are addressing a topic that is close to my heart. My implementation of this concept might be a little different (I wear pajamas in public)…but the end result is the same. I feel incredibly confident when I wear my PJs to events. And I can vouch for the whole idea of being embraced for “coming out” and being myself. (Quite literally. I get lots of hugs, seems I’m flannel and fluffy.) My outfit acts like a magnet: people are either attracted or repelled. Thank you for this post – and especially for taking a more open, non-judgmental “you must dress for success” stand in it! website tag line! Ha ha.